MMA is all the craze nowadays! Gone are the days when boxing dominated the televisions and pay per view attractions. Gone are the dojos of specialized types of martial arts, such as kung fu and karate schools. Instead our t.v. airwaves and pay per views have been replaced MMA events. The karate and Kung Fu dojos have for the most part been replaced with MMA schools that teach a cross reference of different types of combat. 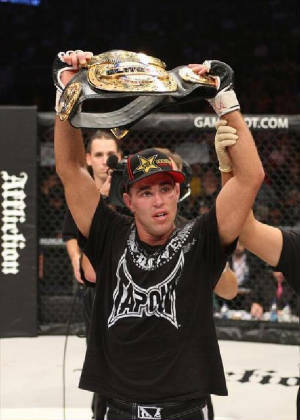 So with the evolution of combat sports comes the evolution of combat training. As a sport advances, so does it’s stars and the techniques they employ to become better in their sport. Sure you could hit a heavy bag a few times, learn some basic wrestling and ju-jitsu moves and run on a treadmill and “call yourself a fighter”. The top guys however have an understanding, that to be great it takes a combination of skill, strength, speed and athleticism. 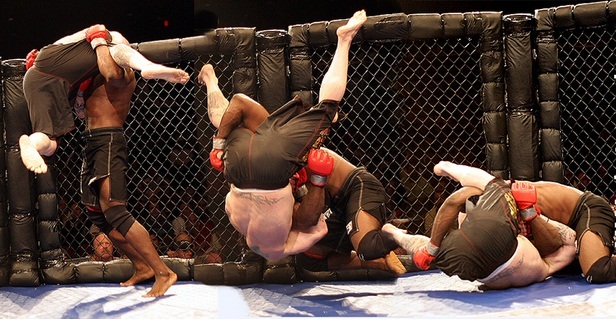 In most MMA training a lot of emphasis is placed on developing fighting skills and conditioning. An often overlooked part of MMA training is the strength and fitness development. Often an upcoming MMA athlete who has developed pretty good skills and techniques overlook the importance of adding strength training to their game. Technique and skill can take you very far in the MMA game until finally you meet someone with equal technique and skill but has more strength. Strength is not only important for helping you control situations in fights but also helps the often overlooked ability to absorb punishment because the body is stronger. When all things become equal strength will become the determining factor! A lot of times athletes will misinterpret being conditioned with being strong. 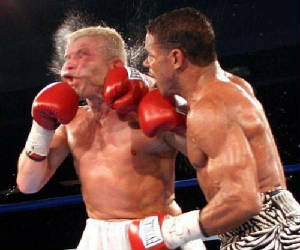 Being conditioned means having the ability to last a long time cardiovascular wise in a fight. Being strong is having the ability to be functional and not get manhandled in the fight because no matter how good your wind is you’re not strong enough to be effective. Building strength for fighting is a whole different beast than just going to the gym and lifting some weights. For all intent and purposes, yes you could just go to the gym, lift some weights and get stronger but this type of training would not be best for your fight training. Fighting is a very anaerobic activity so your strength training needs to be able to build strength, be explosive, and sort of mimic situations you may find yourself in. Here are 7 exercises that I have used with athletes to help build strength in their fight game. Some of these exercises are quite unconventional but very effective. 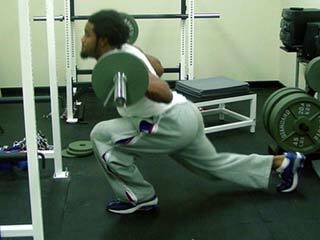 1.Barbell Split Squats-These are important because of the level of hip flexibility they build. The wider your legs are split the more hip dominate the exercise becomes. When a barbell is used your center of gravity is raised more, requiring better balance and body control, two major factors in fighting. They also correlate well to MMA training because it is not often fighters perform motions on both feet at the same time. Weather it be punching out of a stance, kicking, or shooting for a takedown, legs are rarely side by side but rather split gaited. Barbell Split Squats mimic the actions of changing levels on one leg at a time. 2.Zercher Squats-Some of you are saying “What is a Zercher Squat?” A Zercher Squat is a squat performed by holding a barbell in the crooks of your arms. By doing this it forces your body to stay in a more upright position. This builds tremendous quad, abdominal, hip, and glute strength. These are beneficial to MMA training because the double underhook position your arms are placed in almost mimics some double underhook arm positions your arms would be in wrestling an opponent. This type of squat does a great job at mimicking the initial pull and lift of a few types of suplexes. 3.Zercher Good Mornings- If you want an exercise to really strengthen and develop your mid to lower back this is the one for you. The Good Morning exercise is probably the king of all lower back development exercises. Wheather you perform them with a barbell on your back, while your sitting, or Zercher style they will do wonders for lower back strength. Unlike a traditional Good Morning exercise, Zercher Good Mornings are performed with the weight placed in the crooks of your arms. They also use more of a bent leg stance and place more enfaces on total trunk strength. For MMA training we choose the Zercher version of the Good Morning. Zercher Good Mornings use the hip flexors a bit more than the normal Good Mornings. We choose the Zercher version because in fighting it would most likely have the most real world transfer. In situations where someone is definding one of your takedowns or someone forcing their weight down on you, while your trying to force your weight up a Zercher Good Morning would have more practical application than a sitting or standard Good Morning. 4.Walking Barbell Lunges- Walking Barbell Lunges is one exercise that definitely be a mainstay in any MMA training program. 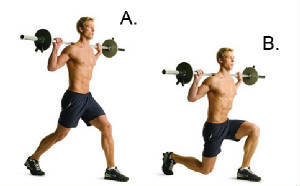 Walking Barbell Lunges develop dynamic explosive strength in the legs. They also build great hip and glute flexibility. Walking Barbell Lunges are also key in building up the muscles of the hamstrings and glutes. The walking motion of the lunge is also superb for building athletic balance. The key to making this great exercise more MMA friendly is long continous strides and pushing upwards and forwards as you continue thru your strides. This exercise will do wonders for improving double leg takedowns and driving through takedown defenses. 5.Barbell Glute Bridges- The Barbell Glute Bridge is one of the most overlooked exercises in almost all sports. Why? Honestly because it looks goofy as s***. However don’t let how this exercise looks scare you off from doing it. This is one of the all time best exercises for building up glute and hamstring strength in a short amount of time. For MMA training Barbell Glute Bridges serve another purpose. They develop the strength a guy or girl needs to bridge off of their back with heavy loads of weight on top of them. If you find yourself on your back under an opponent, and do not have the strength to bridge out from underneath you could find yourself in a world of trouble. This is one exercise that has some of the best “real world” transfer in a fighting situation. 6.Single Arm Dumbell Rows- Single arm dumbbell rows not only build great strength in the back and shoulder muscles but also help develop pulling strength. I do not think I need to mention how important this is if you have to pull an opponent towards you or pull on a body part of theirs during a fight. 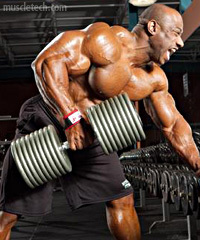 Even the position you hold the dumbbell in is quite similar to how you would grab an opponents wrist or arm if you were pulling them into a position. 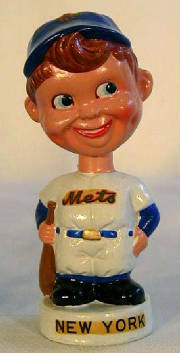 7.Seated Head Harness Neck Lifts- Have you ever seen the neck on a bobble head doll? It is usually thin and the head part of the bobble doll bounces all around because of it. Now have you ever seen the neck on a really strong pit bull? Gently try pushing his head around it won’t work so well. On a side note only try this with a Pit Bull you know and are friendly with. My point being, the head only moves where neck allows it. Part of being knocked out is when your head jars and your brain sloshes thru the liquid in your head and smacks the side of your skull. With a stronger thicker neck the ability of the head to swivel around diminishes. A thicker neck provides a thicker sturdier base for your head. One of the best ways to develop a thicker stronger neck is with a neck building head harness. A head harness will build up some serious neck muscles for you in a relatively short time. Another great thing is these are pretty inexpensive. You can get a good one anywhere from $15-$35. This seems like a pretty small price to pay to help keep yourself from becoming a human bobble head doll. Here we took a look at 7 exercises that can be very beneficial to your MMA training. Instead of just using traditional weightlifting exercises we looked at exercises that mimicked fighting movements, helped develop balance and flexibility, and improved overall strength. Using these 7 exercises can be an added bonus to any MMA training program. So if you are looking to be a better athlete in the ring try your hand at these seven exercises.